First things first, we have a lot of decor addictions here at vavabode. One of my biggest obsessions over the past several years are vintage, oil painting portraits. Just one portrait can make the most stunning impact in a room. It doesn’t matter if the edges and paint are worn, in fact, an aged piece has even more attraction than that of one that is perfect. And, I don’t need to know who the person is, I can just imagine their life story with every stroke of the brush. So we brainstormed here at vavabode — rather than sell off our beloved collection, we decided it would be way cool to apply our vintage portraits to fabric and make a series of portrait pillows — PS: we love art that is functional. Check out this welcoming sitting area. 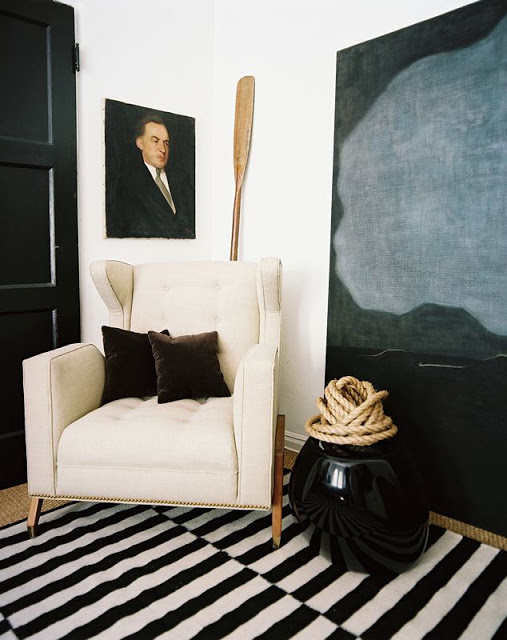 The cream + black with natural wood and rope elements make the old world portrait right at home. Image Elements of Style. I’m envious of this dining room. Modern simplicity meets old world portraits. All eyes are on you in this dining room. — you’ll never eat alone. Gray Benko. 100% Style. Period. Our pillows are feather filled to make them extra comfy and beautifully edged with coordinating velvet. Each pillow is handmade right here in our studio. smoky harvest apple cider margaritas.